The new infographic is ready! We are happy to announce that the results for the school year 2015-2016 are ready! Have a look at our infographic to see how many cities, schools and classes participated this year. The campaign reached over 80,000 pupils in 18 countries. Evidence has shown that the TSG campaign successfully increases sustainable transport modes and reduces CO2 emissions. The EU savings during the second year of the campaign reached 1.218.550 kilometres of car trips and 198 tonnes of CO2. 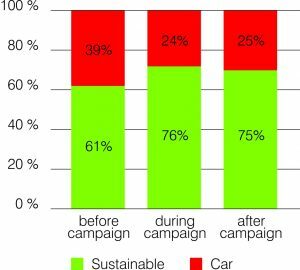 The amount of sustainable trips increased from 61% before the campaign to 76% during the campaign. Three weeks after the end of the campaign this figure reached 75%, showing a higher number of sustainable trips compared to the base level. Do you want to be part of this successful network? It is still possible to join the campaign – you can find more infos here.